In trying to create healthy, satisfying meals that conform to the guidelines of fasting, I am always open to new ideas. Last year we added a lot of smoothies to our breakfast meal - packed with fruit and a bit of flax seed, they offered some variety for the kids amidst the daily oatmeal and bagels with peanut butter during Lent. My one complaint - I don't have a good blender, and making fruit smoothies for 6 people in a mini-food processor took far too long in the morning! So, that brings me to a new idea. My kids love paletas. We are fortunate to have a wonderful little shop in our area that makes them. So, the other day as I was trying to get some inspiration for the coming Nativity Fast, I remembered Jen's post on popsicle molds - well, thank goodness for Amazon, 2 days later I am sitting at home with our mold of choice and a book of "pop" recipes - and while I still haven't managed to discover the perfect combination of ingredients to recreate our local paleta shop's amazing avocado paleta - I'm working on it! 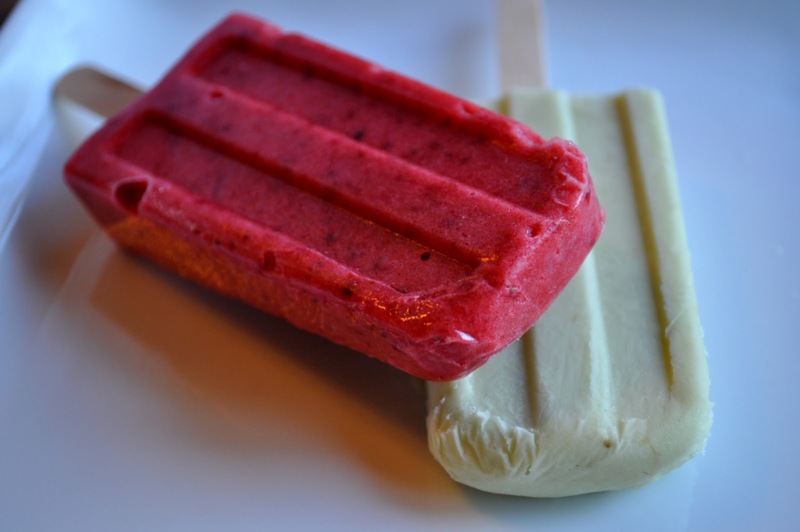 Really though, any smoothie recipe you have can be made up and frozen into pops. I have been making them while I am in the kitchen cooking dinner - pop 'em in the freezer and you are good to go! I am thinking I might need to order a second mold, if I make 20 popsicles at once, I could only have to make them once every few weeks. Combine the liquids and add to the mold, then drop a few slices of mango in before freezing. These have to be eaten quickly, as the alcohol causes them to melt quickly. You can also soak the mango in tequila instead of adding it to the mix, which would give a longer lasting popsicle, but I was trying to use up some leftover margaritas from having friends over. Process avocado until smooth, add yogurt and milk or cream. The best way to determine amounts here is to taste test often! I let the fruits thaw just a bit, then cut and place in processor, processing til smooth. No sugar needed!